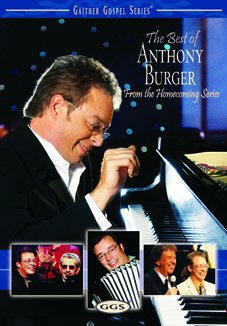 Paul Sizelove, vice president of Gaither Music Group, has confirmed that The Best Of Anthony Burger DVD has been certified gold recently by the RIAA. The actual unit sales required for such a certification was reached within the first few months of this projects’ release, yet due to strict verification guidelines and a backlog of pending certifications, this certification of gold by the RIAA has just been confirmed. “We are truly astounded and gratified that Anthony’s music continues to touch hearts years after his death," LuAnn Burger mused in a recent interview. “Judging from the calls and emails we receive from across the country and the world, his music legacy stretches beyond the gospel genre and blesses, encourages and witnesses to lives. It would mean so much to Anthony to know how many lives his extraordinary playing touched." Anthony Burger Productions recently received notification that Pianorama has been honored as a Bronze Winner in the Film/Video category at the 29th Annual Telly Awards. Pianorama was released as a two-volume collectors’ edition in memoriam to Anthony. The Telly Awards is a premier award honoring outstanding local, regional, and cable TV commercials and programs, the finest film and video productions, and groundbreaking web commercials, videos and films. Winners represent the best work of the most respected advertising agencies, production companies, television stations, cable operators, and corporate video departments in the world. The winners are chosen from more than 13,500 entries from across America and around the world. We are certainly excited to be the recipients of this award. Many of you remember that in 2005, Masterpiece and More was also the recipient of multiple Telly Awards.